It's time that five men on the Supreme Court stop deciding what happens to women. Can't believe we live in a world where we'd even consider letting big corps deny women access to basic care based on vague moral objections. 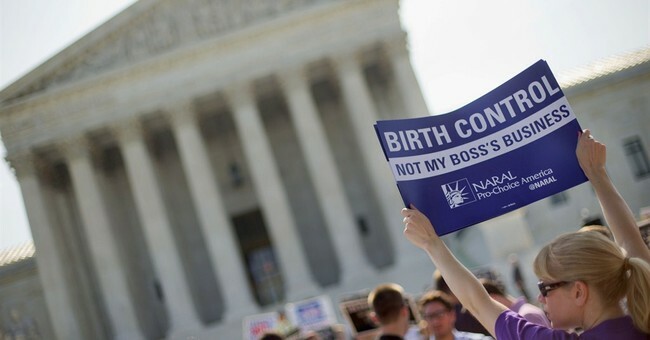 Women who work for the plaintiffs, Hobby Lobby, remain able to use their employer-provided insurance coverage to finance the most popular forms of contraception. They remain free to use their wages to finance the ones Hobby Lobby will not cover. They remain free to find other jobs, too, if they want employer-provided insurance coverage that includes the abortifacients to which Hobby Lobby objects. Congress remains free to enact a new law that requires employers to cover abortifacients and contraceptives and explicitly rules out any RFRA exemptions. It remains free, for that matter, to repeal RFRA altogether. Speaking of the Religious Freedom Restoration Act (RFRA), Hillary Clinton has pronounced herself scandalized by SCOTUS' decision that applied and upheld that law -- which, as we discussed yesterday, was signed by her husband after sailing through Congress with three total 'no' votes. Her comment on the issue, which Allahpundit characterizes as stopping an inch short of "comparing the Roberts Court to the Taliban:"
“You watch women and girls being deprived of their rights, some of them never have them, some of them lose them. Among those rights is control over their body’s, control over their own health care, control over the size of their families. It is a disturbing trend that you see in a lot of societies that are very unstable, anti-democratic, and frankly prone to extremism. Where women and women’s bodies are used as the defining and unifying issue to bring together people – men – to get them to behave in ways that are disadvantageous to women but which prop up them because of their religion, their sect, their tribe, whatever. So to introduce this element into our society…it’s very troubling that a salesclerk at Hobby Lobby who needs contraception, which is pretty expensive, is not going to get that service through her employer’s health care plan because her employer doesn’t think she should be using contraception." Reminder: Huge majorities of Republicans, Independents and Democrats are totally fine with birth control. This debate is not about the moral acceptability of birth control, or women's freedom to procure and use it as they see fit. Also, Hot Air covers a lefty law professor lamenting his side's stupid demonization of the Roberts Court. Two other liberal legal experts have been straying off the reservation on Obama's overreach, as well.